April means that the New Orleans Jazz & Heritage Festival is just around the corner. For the uninitiated, this means two solid weekends of great music, great food, great culture, and great times. My first Jazzfest was in 1987 as a wide-eyed greenhorn, and it was indeed an eye-opening experience. My taste buds were exposed to new delicacies, my eyes were opened to never-before-seen sights (some good, some not so good), and my ears were opened to the world of New Orleans R&B, jazz, blues, and gospel. With New Orleans music, like the food, once you’ve had a taste you’re hooked. While New Orleans jazz has remained a vital force, not just the Dixieland variety, but the modern variety with its incessant Caribbean rhythms, the R&B genre has, for all practical purposes, been on life support since the mid ’70s. That’s a shame because though most of the music is over 40 years old, it sounds as vital and energetic now as it did then. That’s how far ahead of its time the music was then, with its mixture of soul, Calypso, funk, and even jazz. Jazzfest is a great place to hear this music, usually from the original artists who appear there each year, and it surely doesn’t sound like it’s on life support there. 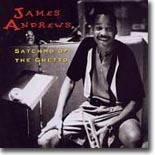 As the title might indicate, Andrews’ gravelly vocals and trumpet owe a strong debt to Louis Armstrong. His band also includes Scott Goudeau (guitar), Charles Moore (bass), Bernard “Bunchy” Johnson (drums), and Henry Love Vaughn (congas). Satchmo of the Ghetto is a fun disc that you might have missed the first time around. Those who love New Orleans music of any kind will want to have this in their collection. It’s guaranteed to get your feet moving.